Lovers of Santa Barbara know there is a carriage museum there. And a fine art museum. And a natural history museum. But only a select few know about The Bottle Shop which can only be classified as a museum for the finest and rarest collection of wines, spirits, beers and alcohols. The major difference is in this museum you can buy the rarities on display. Owned by Mark Trad since 1992, The Bottle Shop’s core mission is to provide quality, value and service in a unique shopping experience where the most special bottles can be found. Trad, whose developed his passion for fine spirits as a boy helping his family made their own ouzo and port, has transformed the sale of single malts, scarce tequilas, rare bourbons, craft beers, small batch gins, artisanal mezcals, imported sakes, hard-to-get rums, Armagnacs, Champagnes, wines and liqueurs to an entirely new elevated dimension. He has sourced the world’s finest, stocking thousands upon thousands of the most dazzling array of rare spirits, wines, and cutting-edge craft beers, enabling you to enjoy a world class shopping experience like no other we know of in California, maybe the United States. Want an 1889 Armagnac? Mark’s got it. Louis XIII Remy Martin Cognac? Easy. An old well-kept vintage port? He has many. Grand Marnier Grand Cuvee in the precious Lalique Decanter? Or Dos Lunas Tequila? Or Nolet’s Dry Gin The Reserve? No problem. In fact, nothing is a problem for Mark Trad. If he doesn’t stock it, he can get it for you in a matter of hours. Try and stump him: the best Calvados, Monkey 47 Gin, Ace of Spades Armand de Brignac Champagne—he has them all. Opus One and Cakebread and other Californians stand patiently at the ready. And The Bottle Shop has a magnificent cigar humidor packed with Cohibas and Davidoffs, among other brands at all price levels. 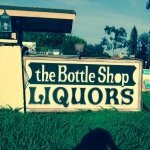 While The Bottle Shop’s strength is in providing the exceptional, outstanding, unparalleled, peerless, matchless, unique, unrivaled, inimitable, beyond compare, without equal, second to none, and unsurpassed brands, they are not to be ignored for a simple bottle of local California wine or a six pack of every-day-drinking beer. We cannot all drink masterpieces every day, nor should we—how else can we know we are drinking the best if we don’t drink some modest things, too. Mark’s got reasonably priced wines, beers and liquors, too, along with snacks and a zillion other necessary items. Lotto tickets and beef jerky, too. Do not miss this memorable stop and this fascinating connoisseur on your next visit to Santa Barbara. 1200 Coast Village Rd, Montecito, CA 93108, (805) 969-4466.